Here you'll find the rest of the Revival dining and occasional furniture collection which is a large collection featuring timeless classic designs and reproductions from Willis and Gambier. The pieces include leather easy chairs, armchairs, display cabinets, sideboards, bookcases, chests,occasional tables and wall mirrors. To find the Revival dining tables and dining chairs click here. The Revival collection is an eclectic mix and match range of furniture fusing rough wood finishes with neutral linens and metal work with a light classical feel, alongside gorgeous handpicked accessories making it hard to ignore. This range has an appeal for all lifestyles with its unique ability to fuse different finishes and styles with no 2 pieces being identical. The image above shows 2 Revival Leytonstone book shelves made from carefully selected reclaimed solid wood with a metal frame. 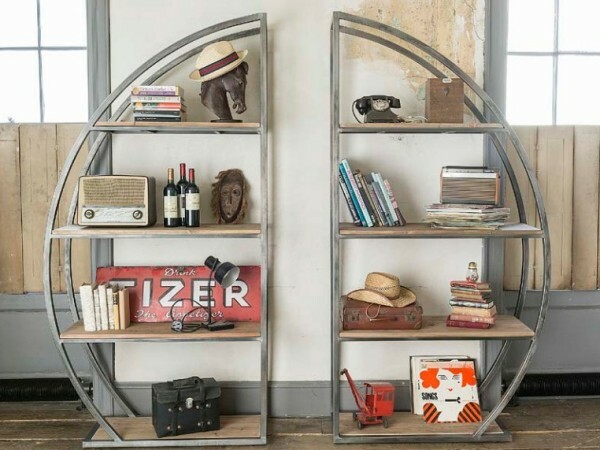 The Willis and Gambier Revival small Redbridge cabinet bookcase is made from reclaimed solid wood and metal work. The symmetry of this piece is reflected in the subtly curved sides and matching plinth base and top, filigrew style metal sides, large double wine rack in the base, 3 wooden display shelves behind open metal mesh doors. You can hang glasses from underneath the top shelf. The Revival Holloway 8 drawer chest made using reclaimed wood and has metal knobs - yes there are 8 not 6 drawers, take a look either side at the top!